This week at the Friday Mashup Cynthia has a sketch for us and would also like us to throw in some pets on our projects....this could be a cat, dog, bird, any animal you might have as a pet! Since the sketch has a word bubble at the top I grabbed the bird that is glancing up and colored him with Copics on a panel of Neenah Solar White cardstock. Using a die from SU's Adorning Accents I cut across the top of the panel to give it some sort of word bubble look. 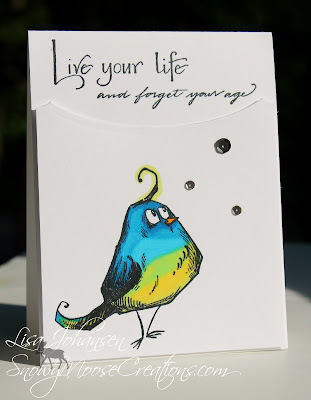 I took this panel and popped it up on a card base of Neenah Solar White and above the cut panel I stamped the sentiment, which came from a set I had won a few years ago. To finish off the card I added some sequins to help tie in the word bubble concept and then called it good. The card is a little different from what I normally do but I really like how it turned out! 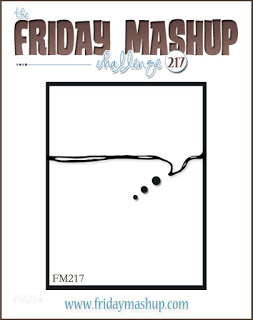 Make sure you head over to The Friday Mashup to see what the rest of the team did and then play along with us! Create a project with a "Pet Theme"
or Mash it Up and create a project using "the Sketch and a Pet Theme"
Super fun and playful card. You did a great job coloring the bird and the sketch! Awesome team challenge card!